IMPORTANT:You must enable the sharing feature before any sharing can take place on the Filr system. After you enable the sharing feature, all users by default are granted rights to share files in the My Files area (this includes files in the Home folder and files in personal storage). 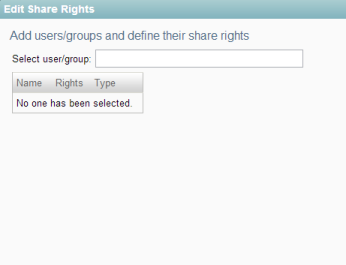 You can then refine sharing rights on a user basis and set up sharing on individual Net Folders. When you enable the sharing feature, it is best to keep the share rights fairly unrestricted (for example, give the All Internal Users group the ability to share whatever they want). You can then restrict sharing of files in the My Files area on a per-user basis, and in the Net Folder configuration, you can set the share rights to be more granular (for example, only Groups A and Groups B can share files from the Net Folder). After you have enabled sharing for the entire Filr system, you can fine-tune share rights throughout the site on the user level. For example, if you want only a few groups of users to be allowed to share with external users, you first need to enable sharing to external users at the site level. After you have enabled it at the site level, you can then remove this ability from the users who you do not want to have this ability. Users who are given share rights on a specific Net Folder are able to share files within that Net Folder that they have rights to at least view on the file system. After you set up sharing for the entire Filr site, all users by default are granted rights to share files in the My Files area (this includes files in the Home folder and files in personal storage), with the site-wide access rights that you specify. If you want only certain users to be allowed to share files from their My Files area, you must enable sharing for the entire site as described in this section, then restrict sharing privileges at the user level, as described in Section 3.2.2, Restricting Share Rights on a User Basis. Under System, click Share Settings. The Edit Share Rights page is displayed. To enable sharing for all internal users on the Filr site, go to the Select user/group field, begin typing All Internal Users, then select it when it appears in the drop-down list. To enable sharing on a per-user or per-group basis, go to the Select user/group field, begin typing the name of the user or group for whom you want to grant share rights, then select the name when it appears in the drop-down list. Re-share items: When users share a file or folder, they can give the users they are sharing with the ability to re-share the file or folder. The user receiving the share can share the file only if that user has been given administrative rights to share the file. Share with internal users: Allows users to share items with internal users. Share with “All Internal Users” group: Allows users to perform a mass share to all internal users by sharing with the All Internal Users group. Share with External users: Allows users to share items with users external to the organization. In addition to selecting this option, you might also want to allow external users to access the Filr site with an OpenID account (Google or Yahoo), as described in Section 6.3.2, Allowing Users to Access the Filr Site with Google and Yahoo Accounts (OpenID). If you do not allow this, external users must create a Filr user account in order to see items that have been shared with them. Users external to the organization receive an email notification with a link to the shared item, and they can then log in to the Filr site. For more information, see Sharing with People Outside Your Organization in the Novell Filr 1.0.1 Web Application User Guide. Share with the public: Allows users to make items publicly available. This means that anyone with the correct URL to the shared item can access the shared item without logging in to the Filr site. In addition to selecting this option, you also need to enable Guest access to the Filr site if you want to allow users to share items with the public. For information about how to enable Guest access to the Filr site, see Section 6.3.1, Allowing Guest Access to Your Filr Site. After you have enabled sharing of files for the entire Filr system (as described in Section 3.2.1, Enabling Sharing for the Entire Site), you can restrict share rights throughout the site on the user level. You cannot grant individual users more rights than currently defined for the site-wide setting. Select the users whose sharing rights you want to manage, then click More > Workspace Share Rights. Select the radio button in the Clear column next to the sharing right that you want to remove from the user or group, then click OK. If you have already removed a share right and you want to add it again, select the radio button in the Allow column next to the sharing right that you want to add to the user or group, then click OK. Ensure that you have configured sharing as described in Section 3.2.1, Enabling Sharing for the Entire Site. Configure sharing for the Net Folder as described in Section 5.4, Creating and Managing Net Folders or Section 5.7, Modifying Net Folder Connections (depending on whether the Net Folder has already been created).